Visiting India? It is naturally that you will visit this monument, do not do it, it is a bit like not going to see the Eiffel Tower when you are in Paris. In spite of this, it is not so easy, because the Taj Mahal is not in the capital. Fortunately, he is not at the other end of this great country, either. As most international flights depart and depart from New Delhi, you will need a way to get to Agra. You have several solutions. The first solution is to fly. It is the safest, the easiest, especially if you only go through New Delhi (in this sense, because you imagine you will not come to India without visiting the capital!) It takes about an hour between Delhi and Agra. The airlines that operate on this route are Kingfisher Airlines and Air India Regional, which also have lines to Jaipur. Of course this is the most expensive means of locomotion, and in addition, it is not necessarily always on time. The second solution is to take the train. For a small fee of around 6 euros, plus one or two euros for commission fees, any hotel or small local travel agency will arrange for you to buy the ticket and explain where to take the train. For this price you will even be entitled to an air-conditioned cabin. Beware, however, you will have to take a few days in advance, the train is quickly crowded. The journey time is 3 hours, it is the fastest, and in addition the trains are approximately on time, it is the means of locomotion that allows to have the most of it, accuracy between expected time and actual time. Trains to Agra are the Bhopal Shatabdi Express and the Taj Express, which are the two most acceptable trains for tourists. Not that the others are not, but they are more intended for premises, with lower rates and more difficult travel conditions. The main train station is Agra Cantt, it is to the South-West of the Taj and the fort of Agra. The journey from the railway station to the hotels costs roughly between 50 and 200 rupees. There is another train station in Agra, which is to the east and is the destination of trains arriving from this direction, is the Agra Fort Station. Another solution is to make the drive. Two scenarios are available: either you rent one, or you go by taxi. The best solution is by far the taxi, because you will not have to worry about driving in a country where traffic can be more anarchic. The real danger is probably pedestrians, and if you're not used to driving in India, do not go there, it's not that easy. Well, it's not unfeasible either, it's just not advised. Otherwise the taxi is still a good, affordable way. The journey time is 5 hours, but it is very approximate, the real time will depend on the state of the traffic, the quality of the taxi, the number of possible incident encountered, etc. If you choose the taxi, plan large, for the time of arrival, you risk arriving late. It remains the bus as a means of locomotion. For a 5-hour journey, it is often the case that he puts 7 or 8, always according to traffic congestion and other more or less serious inquiries. There too you have to take your ticket very early, the buses are even faster than the train. Note that in bus as in car you can make a stop in Mathura, it makes it possible to split the trip in two parts and the place is sympathetic. There are two bus stations in Agra, the Idgah Bus Stand and ISBT (Inter State Bus Terminal). From the city center of Agra it is not easy to get to the site by public transport. The city center is 3 or 4 kilometers from the tourist site but on foot it seems to be a lot more, you have to walk along fast lanes, which you should not advise, especially in India. So the taxi seems the best solution. If you have your own vehicle you will need to park it in one of the nearby car parks and make the final journey by foot or by electric bus. And yes, for reasons of safeguarding the monument, a protective zone has been defined, in the form of a trapezoid and in the center of which is the monument, in which the emission of industrial gases would be restricted. It is an area in which there must be no traffic either, hence the electric buses and the impossibility of parking in the immediate vicinity of the site. The minibus is free for ticket holders. These tickets are bought in kiosks near the car parks and from there they leave for the Taj Mahal. Note the presence of carriages, a bit like on the place D'jama el f'na, in Marrakech (Morocco). In both cases the carriages serve only to offer tourists an original means of locomotion, clean. The children will be the first applicants, and they will have reasons, it is very pleasant. They are chargeable, but the rate is acceptable. The best months to visit the Taj Mahal are October, November and February, possibly March. But this very restrictive list finally does not matter much to the extent that the monument is splendid all by itself, so that you visited it in January, May or August, it remains just as beautiful. One can therefore say that October to March are generally the best months because the weather is generally better than in summer, but the monument itself remains open at any time of the year. The winter months are mild in this region, while the summer is particularly hot. Those who will be on the spot during the summer will have to be accustomed to the hot weather, otherwise it will less enjoy the trip. It is probably the low frequentation of the place that will be the most interesting because it will allow you to enjoy the monument without having around you the crowd of visitors who sometimes gives the impression of spoiling the visit. Curiously it seems that this crowd is not automatic: It often happens that a late arrival on the site (towards 10 or 11am of the morning) does not require a great wait at the crates, the crowd not being present on the spot. But when you know why, you do not know, so it's a matter of luck: Where you spend a lot of time taking your ticket, lost in the mass of visitors, or on the contrary you will be very not many. But be sure that it is early in the morning that there are few visitors. Moreover in the morning the light is very special, especially in winter. With a bit of luck you will see the mausoleum dyeing in pink, before finding its white color so impressive. When in the evening, too, it is essentially the light that will attract you at such a late hour, but as the monument closes early, one should not expect to contemplate the Taj Mahal at sunset. In the evening, the light is rather orange. Otherwise there are visits of the full Moon: From 20:30 to midnight, every half hour starts a night visit, for a discovery of the monument in a new light. Book a minimum of one day in advance, and groups are limited to 50 people. The duration of the visit is very variable, there is no special organization. For example, the London Bridge in London requires going up a tower, crossing the bridge and coming down: The visit is quite framed. In the Taj Mahal, it is not at all, everyone does what he wants. The "normal" visit, if you will, is to go through the entrance doors, to visit the mausoleums of the inner courtyard, to discover the south door and then the gardens. Along the gardens there are interesting arcades, then the small museum where one can see plans of the site, portraits of Mumtaz and Shah Jahan, etc. Once the gardens are crossed, the visitor arrives on the marble terrace where he will have to put on his slippers. A visit to the main mausoleum, then to the mosque and finally to the pavilion of the guests will occupy a good time if we are interested in inlaid stones, bas-relief motifs, cenotaphs, in short everything that makes the beauty of the site. Also do not forget to check out the museum, which is west of the resort, a bit discrete. It contains 3 galleries with original plans of the Taj Mahal and a collection of celadon plates that are said to break if poisoned foods were put in them. It also contains historical documents related to the monument. This museum is open every day of the opening of the Taj Mahal (not on Friday) from 10 am to 5 pm. To do all this count between 2h and 4h. You can do less if you just walk your nose in the air, which I do not advise so much is beautiful. I advise rather to take his time, do not hesitate to stop a little, to stay 1/2 hour on the lawn to look at the mausoleum, to be interested in the Indians who pass, etc. If you take your time, you do not see these 4 hours, well. And there is a typical Indian curiosity, here, it is the many monkeys that pass over the enclosure and come to try to steal something. With the entrance ticket you are entitled to a small bottle of water (welcome, especially in the summer), and small white plastic slippers that you will use before walking on the mausoleum terrace. Muslim design, it is forbidden to walk on it in shoes, where then it is necessary to protect the monument: That is what is done with these slippers. If you do not want to use them, you will only have to walk barefoot. Know that the ticket gives right to an entry, that's all. So it is not a "Day" ticket with which you can enter and exit at will. Organize yourself so that you do not have to come out again, otherwise you are good at repaying your entry. Why is there a different rate for foreigners? Yes, as mentioned above a visit to the Taj Mahal is not at the same price depending on your origin. Indians pay little, very expensive foreigners, and citizens of SAARC and BIMSTEC countries pay in between. Well, if it seems abnormal, India does what she wants at home, and after all it is perhaps a good as the Indians would not be able to visit their own monument, high. As for the solution of lowering the tariff for all, it has obviously been envisaged, but the country can not deprive itself of a financial windfall that helps it to keep the monument in good condition. Know that the citizens of SAARC and BIMSTEC pays 510 Rupees. This decision triggered an outcry, to the point that the Supreme Court of India had to intervene. She declared the increase unjustified and lowered the entry price to the monument to 750 rupees, its present value. However, this should not be the definitive amount because the Uttar Pradesh province takes an important commission on each ticket and will have to mechanically lower it when the verdict of the Supreme Court is passed (which may already be done when you read these lines ). Conclusion: The final price is the one posted on the official website of the Taj Mahal! Entrance tickets are purchased at the parking lot, just a short distance from the monument. The tail can sometimes be very long, you will need a little patience, if you play bad luck. Once purchased, the ticket will give you access to electric minibuses that will take you directly to the Taj Mahal. When you arrive at the door you will undergo a drastic search, with the impossibility of returning if you possess many forbidden objects. Fortunately there are instructions, but do not take the risk of having to go back because there is no available: Do not take anything with you! What is prohibited: Food, bulky books, shelves, miscellaneous accessories, spare clothes, etc. We will only let you go with your camera, your laptop, and possibly a travel guide, if it is not too big. And it will be necessary to insist on passing with material of childcare if you come with baby. Therefore, if you do not repeat yourself, you must insist: DO NOT COME TO TAJ MAHAL WITH THE MINIMUM STRICT. Absolutely nothing superfluous will be allowed! You should also know that the cameras are allowed, but with a supplement of 25 rupees, and you will be forbidden to cross the steps of the terrace, you will be confined to the gardens. Of course, there are instructions inside the gardens to put down your camera. When we say "camera", we do not know what we mean by that. I imagine it is a bulky device, small pocket cameras are not concerned. Moreover, a search is organized before entering the inner courtyard. One queue for women, another for men, and that does not laugh, security issue. Do not take these checks badly, even if they seem offensive. After all, you are in India and it is this country that decides its security, to you, visitors, to adapt. And then you just have to look around to relativize, the Indians are open, smiling, and they take rather well these controls, so there is no reason to get angry. Especially that it will serve you to make you forbid entry. Paying at the end of the visit. It is also possible to rent audio guides in English or French next to the counters at the entrance to the Taj. It's worth 105 rupees only, and if you do not have your travel guide, you'll better enjoy your visit. Among the various inquiries, know that it happens that the Taj Mahal is drowned in sheets of fog, early in the morning. You get up at 5am, you quickly arrive at the monument, you pay your entrance fee and arrive in the gardens and there, surprise: a huge fog keeps you from seeing more than 10m ... It is a mishap which can happen, alas! Want to see the Taj Mahal from another angle? On the other side of the river, there is a bridge not far after the fort. There, on the beach, you will see the monument on the north side. As it is symmetrical it will offer you the same view as the South, and in addition you will see the magnificent wall of red sandstone encrusted in white marble, the one that overlooks the river! Adopt a proper outfit, not extravagant. Visit a mausoleum containing a grave, do not forget it. And then there is a mosque to visit, too there should not be too inappropriate. 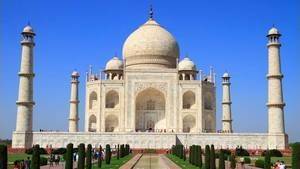 Agra is not renowned for being an interesting city, apart from the two main tourist attractions that are the Taj Mahal and the fort. The city is rather room and attracts many people trying to enjoy the financial windfall of tourists. As a result the visitor will feel assaulted, often harassed, for example by taxi drivers or sellers of souvenirs or bottles of water. Better to know. Some small hotels have an incredible view of the Taj Mahal, especially from a rooftop terrace of the building. But they will have to be found because many of them are rather unhealthy. You are advised to have a real experience feedback before booking somewhere ("Real", it is someone of confidence that speaks to you, not a vague opinion on an Internet site of reservation on line. If you do not, trust the big tourist hotels, they are a bit farther but guarantee a comfort that the Westerners prefer. There are several important points of view at the monument. One of the most popular of the one located just after the main door, at the top of the stairs. We are in height and the mausoleum is revealed to you, 300m further, also in height. This is THE photo to do, but of course you are not alone in wanting to do it. A little patience, then, and civility, all will go well. Taking the same photo before the door is even better since the mausoleum unfolds in the framing, but this picture is even more difficult to do since no one is under the door, something almost impossible to obtain. Another classical point of view is at the level of the central fountain, one sees well the mausoleum that is not yet too high in the frame and it allows to have the fountain as foreground. It is from here that you will do the classic photo, open hand, palm to the sky, with the impression of the Taj Mahal landed on it, in perspective. Once on the terrace you will have a good view on the main door, 300m away from you, but be careful of the time of day because you are turned towards the South, thus towards the Sun. It may be necessary to wait for the evening, or rather to make this picture early in the morning so that it avoids the backlight. On the other hand, by moving to the mosque or the pavilion of the guests you can make a pretty picture of the gardens. Do not hesitate to shift well, not only will there be fewer people, but in addition the prospect will be more beautiful. In the gardens forget the classic walk along the central channel, or then made there, but go back by the sides of the gardens. You will discover the museum and the canals under better angles, more open. On the other hand, on the terrace, you will not be able to take the entire mausoleum, except to place you at the end of the terrace, in the corners. The views of the mosque are the best of this terrace. Finally, for those who can, it is necessary to go the evening or the morning on the other bank of the Yamuna, the river that passes to the North of the complex. When the sun does not crush everything on the spot the view of the buildings is magnificent.